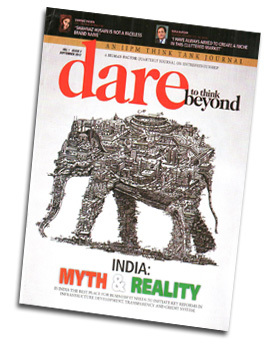 Dare To Think Beyond is a Human Factor's quarterly journal on entrepreneurship. It presents thoughts and ideas, attitude and personalities, trials and tribulations of entrepreneurs who have transformed businesses and societies in India and across the globe. The magazine believes that real entrepreneurial spirit is in dare, to think beyond, to disrupt, relook and overhaul inferior processes into superior innovations.